What are you doing to help save the Earth? It doesn’t have to be anything grand like cleaning up the Pasig River. It can be as simple as recycling your used paper products or throwing your trash in the trash bin. After all, these small changes, when practiced by thousands can make for a pretty big change. Did I even make sense? Anyway. One of the biggest campaigns for environmental awareness these past years is the reduction of use of plastic products. Here in the Philippines, supermarkets and department stores still use plastic bags for the goods you purchase. It was only recently that SM Supermarket started selling their resusable eco-bags for use, with the added incentive for their SM Advantage members to get additional points for using their eco-bags instead of plastic bags. Also, I heard that last Christmas, a number of companies in the Philippines released their reusable shopping bags. Though I’ve yet to see people using their eco-bags for their groceries or shopping. 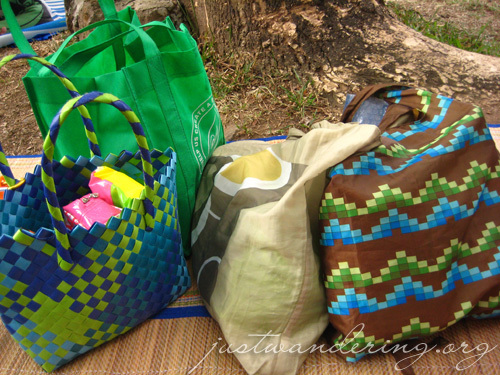 Envirosax bags, re-usable shopping bag from Coles and my mini-bayong. If you look closely, you’d see the blue bubble bag from Kamiseta circa 2001. It is estimated that 500 billion plastic bags are used and discarded worldwide every year. 1 million plastic bags are used and discarded worldwide every minute of the day. Envirosax, an advocate for environmental sustainability, aims to reduce the use of plastic bags by promoting the use of plastic bag alternatives: eco-friendly reusable bags that are lightweight, portable and waterproof. They’re cute to boot, not to mention a must-have in every packing list. Up until recently, Envirosax bags aren’t available locally. Thanks to Phoebe, I learned that Gourdo’s is now stocking the Retro Kitchen series of Envirosax for Php 375 each. 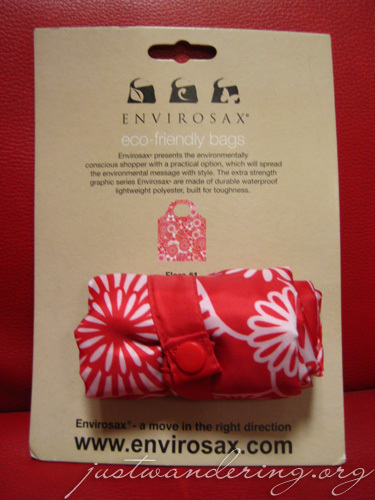 Or you can win this Envirosax Flora #1 bag from Justwandering.org. This is your future shopping bag. In celebration of Earth Day and my blog’s 2nd anniversary, I’m raffling off this Flora #1 Envirosax bag to one lucky JustWandering reader. Simply comment on this post, and share with us what you do to help save the environment. Double your chances of winning by commenting AND blogging about this contest and linking back to this post (please drop me a line or send a trackback so I’d know you posted). Envirosax is distrubuted locally by Zolo Enterprises. Aside from Gourdo’s, the bags are available at Fully Booked, Nothing But Water, Meet my Feet, The Reading Room, Shepherd’s Staff, My Spa, Hooked on Books, The Learning Gallery, Island Girl, Republik BTC and soon, Hobbes and Landes. You can also order online from the Envirosax Philippines Multiply Site. Sweet bags! Save the planet AND look trendy at the same time. My, you’re fast Congratulations, you’re my first contestant! let’s see. i drive a prius, which should save a bit of gas, use energy efficient light bulbs… i recycle too. go me! I contribute to saving the earth by turning off my PC when I leave for work (instead of leaving it open to get my torrents. :3) Whee~~ <3 Happy Earth day peoples! I unplug electrical appliances before leaving the house. We make sure all our bulbs are energy saving ones. I turn off my monitor when I leech my torrents (come on, I can’t be thaaaat good). And I do try to use my reusable canvas bag / not get plastic bags and slip everything in my purse when I remember—sadly yes, it’s only when I remember. Something I try to remedy. And I save water by bathing / showering only once every three weeks—JUST KIDDING! 1) i use a glass to hold the water i use when brushing my teeth, and do not leave the tap running the entire time. 2) i try as often as i can to bring my STARBUCKS commuter cup with me so that they don’t have to use paper/plastic cups. 3) i shower with cold water! it’s refreshing, and helps save electricity from heating. 4) i recycle packing material from my ebay parcels like boxes (organize my stuff at home/work) and bubble wrap (line the inside of drawers and closets). 5) when i buy snacks or drinks from convenience stores, i ask them not too put my purchases in a plastic bag. how do i contribute in saving Earth? – i recycle water used by my 6-month old baby for his bath as water for cleaning the dusty cement floor in the open area of the house; also used as ‘pambuhos’ in the toilet when making poo-poo…hehehe. that’s all i can think for now. I already recycle and compost about 85% of all my waste, only throw out the stuff I can’t put in the blue bins. As for tomorrow, I plan to urge people not to take receipts or plastic bags at work, ask them to put their purchases in another bag or carry them. Unfortunately I cannot refuse to give them a bag, but I hope I can educate them. I’m also going to take the bus to work, but I always do that, since I don’t have a permit! aha! wala ako sa listahan therefore di ako disqualified! ahehehehehe! nag dinner kami kagabi ni toot toot. I’m VERY happy to see so many readers commenting on this post! I dunno… somehow I end up with more tote bags than I can count. They’re as much of a hassle to get rid of as the plastic bags, sometimes. Some of this enviro-marketing is simply… marketing! It’s designed to get you to buy stuff. Buy stuff (like bags) so you don’t use stuff. Uh… how does that work again? Anyway… I replace regular bulbs with fluorescents as the old ones burn out; no electric heat or AC in my house — just open the windows and let the breeze blow through! I’m the only stinkin’ staff member at my work place who gives a rip about recycling, and I’ve put a recycling bin outside my classroom… and I’m constantly digging bottles and cans out of the rubbish cans that are dropped in by teachers who ignore my recycling bin! (We’re doomed, people! We really are!) I pick up so much trash off the beach and the bike path every time I go for a walk or ride, it’s not even fun to go for a walk or ride anymore. I reuse most of the packing material from all the Pinky:st figures I buy on-line. We recycle almost all the cardboard and newspaper that comes into the house. I don’t subscribe to newspapers, because they just pile up, and if I need to see one I can pick it up free at work. I don’t have children, because with six-billion people on the earth, there’s more than enough resource-gobbling humans without adding more. I plant Crown Flower bushes in the yard to attract butterflies, and I pick up the caterpillars that are knocked off the leaves after a heavy rain and put them back on the bush. And to keep this “travel-related,” on the rare occasions when I travel, I stay at cheap hotels where they let you reuse your towels for a couple of days before laundering them. Wow! Kasabay pala ng earthday anniv mo hehe. Happy anniversary. And neat contest giveaway pa! Uhm, lemme see. The only thing I can think of is! Not litter on the street. I make sure I always throw my trash (regardless how small or big it is) into a garbage bin/container. If there aren’t any around, I keep it inside my bag. I love fresh air. If it’s windy outside, I prefer to open the windows to my room to let the fresh air come in then switch off the electric fan to conserve energy. I never throw plastic bags needlessly. As long as it can be used, I keep it for future needs. Then there’s using a water bottle instead of the available paper cups in the pantry and using a towel/handkerchief instead of tissue paper. hmm.. there are few things I do which I think can help save the earth! 1. having a new envirosax to use which has eco-friendly trend written over its design instead of plastic bags…or simply ditch the plastic bags! Well I don’t litter. And I don’t let my friends either. I’d rather keep the trash in my bag to throw in the bin later on than leave it anywhere. (and I’m very OC on this, even my hubby says it’s weird that I do this). Conserve Energy. No Aircon. Turn off appliances when not in use. I turn off my Computer Monitor not the CPU though when I’m at home and not using it. Although I turn CPU off if I’m going out even just for awhile. unplug appliances when not at home. Conserve Water. Not leave the water on the faucet running when Washing dishes, washing face, brushing my teeth, etc. Hi Nina! Here’s my contribution on how I show my love for Mother earth! Hi there! You are invited to to participate in a blogging FGD conducted by a team from dot ph domain (i.ph) . Tentative date would be April 29 (Tuesday) after office hours, around 630 onwards. FGD will last for approximately 2 hours. Snacks will be provided. Please leave a msg on my board so we can discuss details as to when you are free Thanks! Hi Nina! Loving your new template now!!! Congratulations on your blog’s 2nd anniversary! As for my contribution, I don’t throw litters anywhere. i make sure I look for grabage bins/trash cans. Coming from a place like Davao, we’re used to observing this practice. Trash are also segregated: biodegradable and non-biodegradable. I don’t request for cc paper bills also — save paper, save trees. Waah, I’m late for the contest! Anyway, my major contribution would be reprimanding (in a nice way) a lot of people when I see them littering, using paper (Yeah, using paper in the office. I tell them to use the Notepad or stickies instead and go paperless! If they can’t do that then I tell them to at least recycle scratch papers etc. ), I use Blackle instead of Google, I blog and promote about earth-friendly stuff, and I’m a volunteer/supporter of Greenpeace, etc.